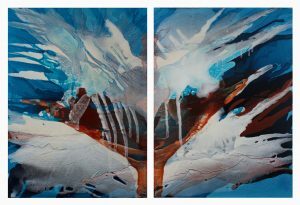 ‘Fluent’ refers to the artist’s technique in which paint is poured in its liquid form and allowed to dry before another transparent layer is applied. The work is inspired by both the macro and micro worlds of nature – the sky, fungus growths, and patterns created by wind and rain. Celestian views nature as a metaphor for human experiences and emotional states of being. The exhibition will be on view from Nov. 4-23, with an opening reception on Friday, Nov. 4, from 5-7 p.m. The reception is free and open to the public. Celestian will attend to discuss her painting techniques and her new work in glass which will also be on view in the show. Celestian received a 2016 Individual Artist Fellowship in Visual Arts, Painting and is a co-founder of the Highland Arts Garage, Wilmington. Learn more about Celestian with our YouTube Meet the Artist video series.